Varifocal camera lenses provide more flexibility at installation time, but come at a higher cost. Fixed lens cameras reduce hardware costs, but can make getting the right Field of View more difficult or costly. How often do integrators choose one over the other? In our 2014 Varifocal vs Fixed Lens survey varifocal lenses won out, but since that time the market has seen significant technology and price shifts. Has this affected integrator preferences? We look at this topic again based on updated survey statistics to see what integrators now prefer. Price was a big driver for choosing varifocal vs fixed lenses, but many times the final cost for the camera was a factor of time spent on system design + hardware cost + installation time. This sometimes made a more expensive varifocal camera turn out to be cheaper overall than a fixed-lens alternative. Delivering a quality image was a major driver in choosing which lens type to use, however integrators had two approaches to this problem. "I try to use 100% varifocal unless cost is a factor. I like to have the ability to adjust the FOV during the install. Gives the installer and customer greater flexibility." "60% varifocal and 40% fixed. Varifocals are used when there are requirements to meet regarding pixels per meter etc. Fixed lenses are used where price is key and it's enough with an overview." "Most of our cameras use varifocal, unless we can determine a need that only a fixed focal length will handle. It's just easier to get the angle of view the client wants with a varifocal." "Varifocal 80%. Vari is flexible and can adjust, easy to use the auto focus feature unless re-aiming is required." "Almost always varifocal. The cost isn't much higher and the incremental cost gives us flexibility on the install." "95% fixed, little need for zoom when the cameras are 4MP." "Used to be all varifocal now with higher res fixed lens cameras reduces need for varifocal especially for indoor applications." "If the customer is clear on what he wants to look at and if we estimate properly then we would choose a fixed lens especially if it's in 4MP." "50-50. VF are nice as you get more flexibility in camera placement but with an added cost and added size to a minidome. With better resolutions we find fixed lenses like 2.8mm and 4mm are good because they get a wide FOV but you can still digitally zoom after the fact." Requirements sometimes change over time, particularly in retail settings, and for this reason integrators used varifocal lenses to help customers get the most value out of the camera over a longer time period. "50% in Retail areas or areas where scene changes and a different view may be required." "I believe all of our cameras are varifocal. Sometimes we will move a camera or repurpose it, thus needing to adjust the FoV, etc. that you can't do with a fixed lens." "Majority are going to be varifocal. Easier over time to adjust FOV and change the image to get another or new angle." "Mostly varifocal, gives us more flexibility at the time of installation and more possibilities to adapt to the clients wishes." "All of them are varifocal lenses for the use of autofocus and in retail they change interior layout of the store at marketing request." "Most of them are fixed focal lenses. Mostly because price effectiveness." "Fixed lenses are used where price is key and it's enough with an overview." 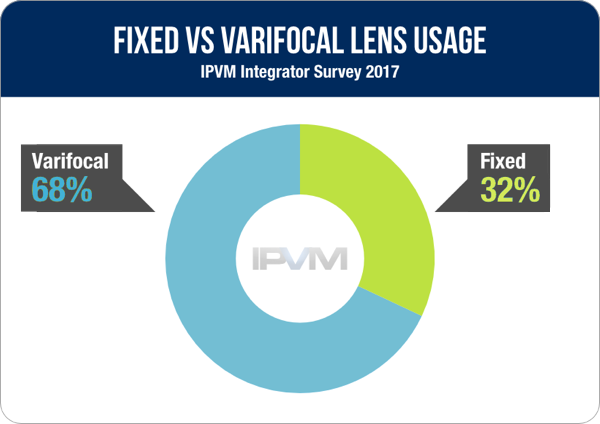 "80% of our installs would use vari-focal. If the opportunity is largely being driven by price, and not design, we will then go to fixed lenses." "Approximately 70-80% fixed lens due to low-cost. Most applications that we sell to do not really require vari-focal lens." "Fixed lens cuts down on the install times"
"Only use fixed on microdomes and down market cheap jobs, which are rare for us." "Varifocal lenses are deployed 80% of the time. We will use a fixed mini dome for some customers who like to save money. These jobs do take more time to engineer to get the correct lens for the job." "50/50 - usually design with varifocal lens to get specific ppf at certain ranges. Will use fixed focal when price is an issue or concern." "90%. Varifocal typically comes with remote focus, which is severely shortening install and setup times. "We prefer motorized zoom lenses. Easy to install and commission. Only in low price project we offer fixed focal lenses." "70% varifocal. Cameras with motorized lens varifocal keep dropping in price while labor rates continuously rise. We still used fixed cameras for small rooms like offices, but varifocal work well in hallways and big retail areas. We also find that it is hard to source fixed lens cameras with focal lengths past 8mm while varifocals generally go to 12mm." "50% fixed lens when we are getting smashed on price, we still prefer a varifocal and particularly an autofocus VF as it saves commissioning time." "We used motorized zoom domes for ease of focusing to save on labor." "80% varifocal Ease installation and better able to suit customer wishes"
"Varifocal when the price allows, more installation flexibility"
"40% at least would be varifocal - Ease of deployment, remote focus reduces TCO and we can customise zoom area on the job rather than having to have it perfect on the design." "I only use the Fix lens when I have exact drawing and I did the design and know what type of lens is needed for the area, so I select only the fix lenses cameras." "We will use a fixed mini dome for some customers who like to save money. These jobs do take more time to engineer to get the correct lens for the job." "70/30. Varifocal mostly when not sure of exactly what they want to see. More flexible. Fixed when we know for sure what the scene is and if price dictates." "Fixed focal length is preferred due to better f-stop but requires a bit more advanced planning so that the correct camera/lens/imager is ordered and installed." "The only fixed focal length cameras we use are Avigilon's micro domes. Even if they had a wider range of fixed lens cameras available, we wouldn't use them. It's not worth the hassle of having to explain to a customer that it'll cost them the price of a new lens if they want to zoom a camera in a little bit, and no matter the amount of CAD drawings and site demos/tests we do, they will always want to make minor adjustments after the install." "Most cams we sell have integrated lenses, not boxes. So it's rare that we specifically choose fixed vs varifocal. I prefer fixed bc picture quality and aperture are better, but most high-quality cams with integrated lenses are varifocal." "100% Varifocal. Not because we have anything against fixed, but most of the cameras we sell simply are varifocal. 75% fixed, 25% varifocal. Inexpensive cameras all have fixed. Our high end domes, bullets etc. are all varifocal. I don't typically need varifocal as we use them at their widest setting, but auto focus is sure nice to have and the ability to slightly adjust the image." "We use 90% varifocal. I'd rather see us use more fixed lenses, but a lot of times, the other, more advanced features we need are only embedded into the varifocal devices." "Vari-focal 90% just due to the fact that we sell Axis and prefer the P32 series for its cost/value. The M series cameras are used in certain circumstances, but more in special situations."